Top row, from left: Teresa Jacobo, Luis Artiga, George Mirabal and Oscar Hernandez. Bottom row: Victor Bello, Robert Rizzo, George Cole and Angela Spaccia. Not pictured: Randy Adams. 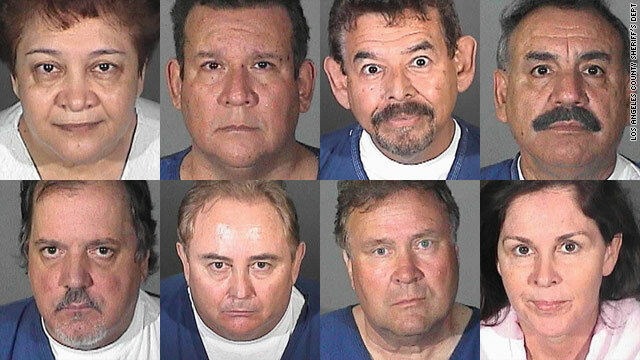 Los Angeles, California (CNN) -- Eight current and former Bell, California, city officials arrested and charged Tuesday with misappropriation of funds and making or receiving illegal loans demonstrated "corruption on steroids," the Los Angeles County district attorney said. The charges allege the officials misappropriated more than $5.5 million, including being paid for phantom meetings, District Attorney Steve Cooley said at a news conference. High salaries paid to officials of the city sparked local outrage and national attention when they came to light in July. Bell City Manager Robert Rizzo, Police Chief Randy Adams and Assistant City Manager Angela Spaccia resigned after media reports that they were making several hundred thousand dollars a year each. Adams was not charged, Cooley said. "The complaint alleges they used the tax dollars collected from the hard-working citizens of Bell as their own piggy bank, which they looted at will," Cooley said at the news conference. Arraignment is scheduled for Wednesday. In addition to Rizzo and Spaccia, those arrested were Mayor Oscar Hernandez, Vice Mayor Teresa Jacobo, council members George Mirabal and Luis Artiga; and former council members George Cole and Victor Bello. Bail ranged from $3.2 million for Rizzo to $130,000 for Cole. A battering ram was used to secure the arrest of Hernandez, Cooley said. Rizzo, who was being paid nearly $800,000 annually, is charged with 53 counts of misappropriation of public funds and conflict of interest. Among the allegations are that he wrote his own employment contracts and that they were never approved by the City Council, prosecutors said. Cooley alleges that Rizzo, hired as Bell's chief administrative officer in September 1994, gave nearly $1.9 million in unauthorized loans to himself, Spaccia, Artiga, Hernandez and dozens of others. Rizzo is responsible for $4.3 million of the city's losses, Cooley said. Rizzo's attorney, Jim Spertus, said Cooley ensured that reporters witnessed the arrest of his client and called it "grossly unprofessional." "Candidate Cooley wants some good campaign material," Spertus said, making reference to the district attorney's candidacy for California attorney general. "[Rizzo's] salary was openly transparent to the City Council, and the council approved it," he said, adding that his client will fight the charges. Spertus also said the city's loan program followed procedures and that Cooley's office did not interview many pertinent witnesses. Prosecutors charged Hernandez, Jacobo, Mirabal, Cole, Bello and Artiga with nearly two dozen counts of misappropriating approximately $1.2 million of public funds. Cooley alleges that they held "bogus meetings" that lasted only minutes at a time -- or not at all -- and collected payment. "The [council] for their part provided no checks, no balances," Cooley said. "The council members were busy enriching themselves for collecting money for meetings that never occurred." California Attorney General Edmund G. Brown recently sued several of the former officials "to recover the excess salaries" that Bell officials were being paid. He also was pursuing a reduction of their pension benefits. "This is a very serious matter when public officials breach their duty to the public and enrich themselves with enormous obscene salaries which then trigger pensions of similar magnitude," Brown said. The suit accuses officials of fraud, civil conspiracy, waste of public funds and breach of fiduciary duty. It also alleges they deliberately misled citizens about the accurate amount of their pay. Bell, in southeast Los Angeles County, had 36,624 residents as of the 2000 census. The median annual income is less than $35,000. Rizzo's last annual base salary was $787,638, Adams earned $457,000, and Spaccia received $336,000, according to Brown's office. Before recently cutting their pay, Bell city council members received $96,000 a year, compared with $4,800 a year earned by council members in similar-sized cities. Since 1993, the council raised Rizzo's salary 16 times, with an average jump of 14 percent yearly, the attorney general said. In 2005, he received an increase of 47 percent. Since 2001, city council members also awarded themselves 16 percent raises yearly. Brown, who is running for governor, said Rizzo prepared a memo for the public saying council members received $673 a month and he was paid $15,478 a month, which would amount to annual salaries of about $8,000 and $185,000 respectively. Brown said his suit is separate from a criminal probe, and he added that he plans to widen a statewide investigation of public salaries and benefits, and called for legislative reform. He said he was serving a subpoena on the city of Vernon, which is near Bell, "to obtain compensation records for city officials and employees." News articles have reported that one Vernon city official received an annual salary of $785,000, and another received a total of $1.6 million in compensation in a single year, according to Brown. Vernon has a population of less than 100 people. Also last week, acting California Gov. Abel Maldonado signed legislation to return "illegal and excessive taxes" to Bell residents. California State Controller John Chiang said last month that property owners in Bell paid and estimated $3 million in extra taxes over the past three years. Bell passed an "illegal resolution in 2007 that resulted in a 50 percent increase in the tax rate over the course of three years," according to the governor's office. Chiang said Bell began raising property tax rates in 2007 to pay for pension obligations, even though state law caps those taxes at the rate used in fiscal year 1983-84. The lower rates would deliver, for example, an estimated $250 in annual savings on a property worth $275,000. Cooley said the citizens of Bell did not act as a watchdog. "The electorates of these cities have to be involved if they really care about their city. That did not happen in this instance." CNN's Phil Gast contributed to this report.